How Prepared Are You For The Release Of Forza Horizon 3 On Windows10 By Microsoft This September? One of the most anticipated upcoming racing video game which is developed by Playground Games and to be published by Microsoft Studios is scheduled to be released on the 27th of September this year 2016. It is going to be release on the Windows10 and Xbox One platforms and because this upcoming star racing game support play Xbox Play Anywhere, you will be able to play it on both your Xbox One console and your Windows10 PC at no addition cost if you have bought it for your Xbox One console, is this not lovely? But are you prepared for the release? Let us first of all walk you through the PC specifications of Forza Horizon 3. Why should you get prepared for the release of Forza Horizon 3? 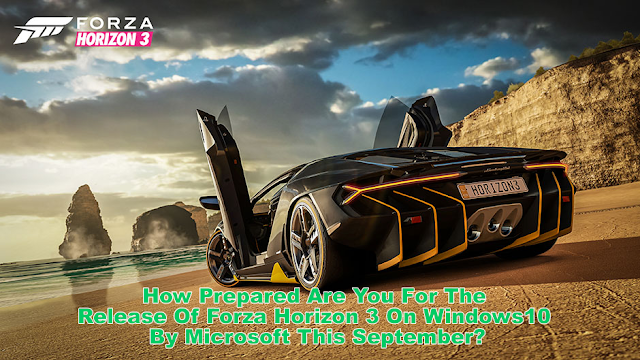 Are you wondering why you should get prepared for the release of Forza Horizon 3 on Windows10 this 27th of September 2016, then take a second look at image of one the available you to to race with which is above and consider this facts. Forza has over 11 milion passionate players on Xbox One already is the best-selling racing franchise in Xbox Onc console. As mention at the beginning of this post, Forza Horizon 3 on Windows 10 will support Xbox Play Anywhere, so you will not need to buy it again if you already have it on your Xbox One console. Imagine how diverse, beautiful the scenery will be and how fun Forza Horizon 3 will be, -a game that is twice the size of Forza Horizon 2 and this powered by DirectX 12 technology and the latest version of ForzaTech, making it to be referred to by the developers has the most diverse, beautiful and fun open world game they have ever built. Forza Horizon 3 on Windows 10 is a game where you can even customize the sound of the horn of each vehicle, customize the character of your drivers and their body kits and modify the race events. The Forza Horizon 3 on Windows 10 will showcase more than 350 cars at it's launch this September, and for the first time, the Horizon game explored fully in the ForzaVista mode. More to that also is the fact that you can play online competition together with players in the same game session in a four-player campaign co-op or the just the normal online head-to-head multiplayer. Forza Horizon 3 on Windows 10 is a game worth preparing for it's launch. Will you?